In my travels, I have seen Sidebone starting on horses as young as 3 years old! 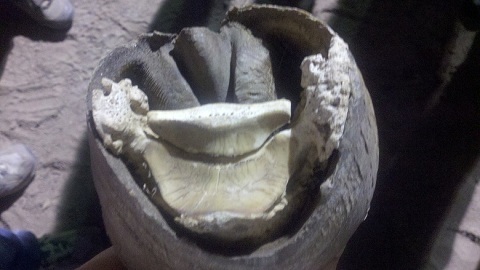 What causes calcifications like Sidebone, ringbone, arthritic hocks and knees that can lame our horses and decrease the years they can be ridden? When a horse’s body is not correctly loading a moving part, like a joint or the hoof, then heat is created just like the friction caused by rubbing 2 sticks together to make a fire. The body sends calcium to the heated area to cool the tissues and bones. Eventually, this creates calcification which is porous just like the coral skeletons you find in the ocean. As our horses get older they feel this calcification — just like we do when it happens in our own bodies. How can you help your horse and can those same treatments be applied to us? Raw apple cider vinegar has been known to smooth out calcium deposits that have been laid on bones in horses. There is some research that suggests that entrolyths can be decreased and even prevented if you are feed apple cider vinegar on a daily basis. For our horses, we gradually introduce it into the feed until we reach approximately 1/3 cup a day. If you search online for the benefits of ingesting raw organic apple cider vinegar, you will find a long list of benefits for humans and horses. In my my experience, horses seem to love apple cider vinegar in their feed. Not only does apple cider vinegar benefit horses, it may benefit humans as well. Many of my friends take 1 teaspoon morning and evening in a little water (add honey if needed to make it a little more palatable). Apple cider vinegar helps the body to be alkaline — yes, even though apple cider vinegar is acidic, it helps with alkalinity in the body. This regime has helped many of my friends with acid reflux leave their meds behind. As you may know, it is best to have an alkaline body where cancer cannot thrive (so yes, this is especially recommended for grey horses which are more susceptible to melanoma). Then, I use Dynamite® Balm, an all natural product safe for our skin and horses. It comes from the earth, as is, and no other ingredients are added. Use the balm to treat the outside and the raw organic apple cider vinegar to treat the inside— you’ll get faster results! April travels internationally teaching a variety of classes to interested horse lovers all of which are designed which will dramatically change the relationship between horse and owner while improving the overall wellness of both the owner and the horse. Have questions? I am always happy to help (530) 823-7321 Hawaii time zone. Be sure to like my page Holistic Horseworks on Facebook and connect with me on Linkedin.